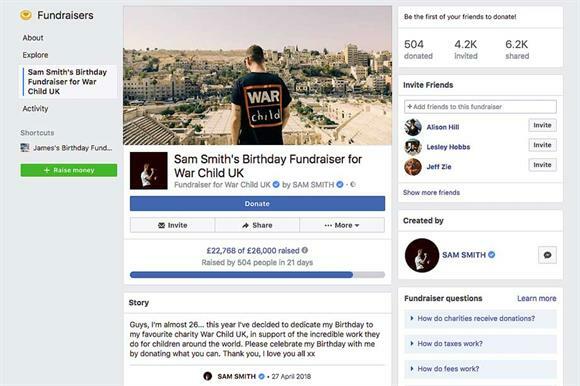 Singer Sam Smith is leading War Child UK’s Donate Your Birthday’ campaign by appealing for donations through Facebook’s birthday fundraiser tool. Smith, who is a global ambassador for the charity, has donated his birthday to raise £26,000 by the time he turns 26 on 19 May. He more than doubled his initial target of £5,000 within a week and the appeal now stands at just under £23,000. Facebook rolled out its charity fundraising features in the UK in November last year, including the option to donate your birthday. Users can create fundraisers for charities, set financial goals, write personal messages and include "Donate" buttons. When a fundraiser clicks "create", the fundraising goes public and friends can receive notifications inviting them to donate to that cause. iERA, a UK-based Muslim charity, has launched a series of free webinars and podcasts to help other charities. The iERA Charity Management Series is a bi-quarterly series that takes users behind the scenes of a growing charity, giving them insights into its learning and how it is implementing its policies, processes and procedures. The series has begun with one of the hot topics of the day, the General Data Protection Regulation, with a podcast and a webinar. The charity will go on to look at risk management and other issues affecting charities’ operations. The series will be led by iERA's chief executive, Andreas Tzortzis, who commented: "This series, both as interactive webinars and podcasts, is our way of sharing best practice and opening up a space to raise the standards of how charities operate within the Muslim charity sector and beyond, for free." Kirsty Marrins: How do you solve a problem like Facebook?